This is a really simple and cheap idea to bring solar light into a dark room. 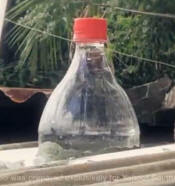 A regular 2 litter polycarbonate soda pop bottle is fitted into a sealed hole in the roof. The bottle is filled with water and a bit of bleach. 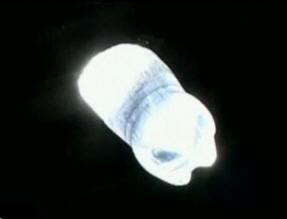 The sun shines in the top of the bottle, through the roof opening, and then the bottom of the bottle spreads the light around the room. It is said to work much better than simple window in the roof. This works well, but the roof penetrations are a leak waiting to happen sadly. They could be put high in walls with an exterior overflashing, but that niche is filled by windows of course. I'm guessing this has a use for rooms without exterior walls, a skylight niche replacement. This is interesting. I wonder if there is a way to use a solution to keep it from freezing without inhibiting the lighting? I have to agree with Mike, unless provisions are made, it looks like a leak. Great idea though. Also it's better than a skylight because it produces diffuse light instead of a beam of sunlight. It really is more comparable to a bulb (or a light-tube, if you prefer).